In 11- or 12-inch ovenproof skillet, heat oil over medium heat. Cook carrots and potatoes in oil 5 to 6 minutes or until vegetables are browned and softened slightly. Add beef, gravy and rosemary; stir until well mixed, breaking up beef, if necessary. Cook about 4 minutes longer or until beef and gravy are heated through. Unroll pie crust on work surface. Roll into 12-inch circle. If desired, flute edge. Prick with fork several times. 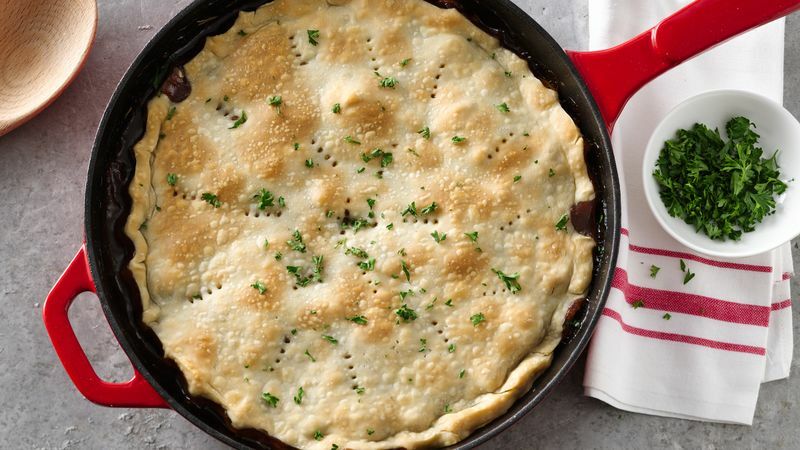 Place pie crust on top of beef mixture in skillet. Bake 20 to 25 minutes or until filling is bubbly and crust is golden brown. Sprinkle with parsley. Cut into wedges to serve. Cover and refrigerate any remaining pot pie. Use leftover beef roast or steak in place of the purchased beef roast. Sneak in an extra serving of vegetables by stirring in a cup of canned sweet peas.